On Saturday, March 12, Beat the Streets Wrestling held its first-ever Step into the Circle adult wrestling tournament. The tournament, perhaps the first of its kind, was a fundraiser to benefit the youth wrestling programs organized year-round by BTSNY. Before anyone even hit the mat, the event was a success: The participants had worked together to raise over $46,000 in the weeks before the event; the eventual total, over $48,000, was 150% of the original goal. All that was left was to enjoy the day with good friends, great snacks, cold drinks and friendly competition. Ken Bigley, the Director of Programming at Beat the Streets and the effective ringleader of the day’s festivities, wanted to “emphasize the "F-U-N” in "fundraiser." From all appearances, he more than succeeded. The energy in the building was high from the very start. Classic rock blared in the gym and a youth practice wrapped up as the first competitors arrived. This excellent reminder of the event’s purpose, to benefit the young wrestlers from across New York City, had some of the Circle’s participants more enthusiastic than ever. The wrestlers were men of all ages and wrestling backgrounds, from recent college graduates to middle-aged enthusiasts. Despite their age differences, all the participants were smiling as if they were kids again as they looked over the brackets displaying their potential match-ups. The names of the weight classes were another personal touch by Bigley that added to the jovial atmosphere: there was the “Older Guys” bracket, “Gained a Little Lbs,” and “Gained a Lot Lbs,” to give a few examples. Fusion Physical Therapy (www.fusion-pt.com) was present for the event and helped provide ATC services. Strength and conditioning coach Eric Grantham had worked with collegiate wrestlers, but never adults. “This is legit,” Grantham said, noting the excellent turnout and called the event a “game-changer” for Beat the Streets’ fundraising efforts. Beat the Streets volunteer Anna Zarzecki also observed that the “energy in here is great” and praised the staff’s efforts in putting together the event. After they had time to prepare, the wrestlers were eager to get on the mat. The first match from the Lightest Guys division pitted Glenn Van Moffaert of Twin Towers against Chris Hanley of Team Staten Island. It was a ferocious but fun bout that helped set the tone for the rest of the afternoon with an 8-0 win for Van Moffaert. 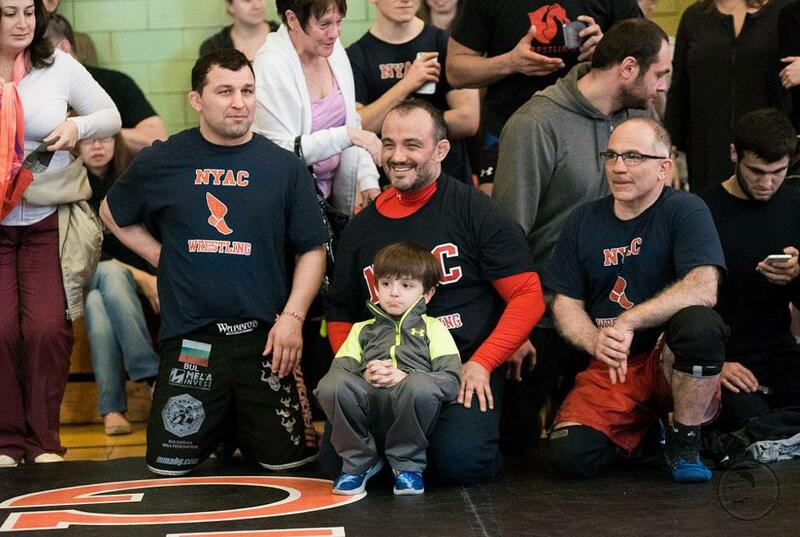 Tavakolian’s passion for sharing wrestling with youth was all the more apparent from the way he brought along his five-and-a-half year old son, Navid. Navid was laconic when asked for his thoughts on wrestling, saying simply, “it’s good,” but has already started wrestling himself. He showed off a powerful stance and says he cannot wait to begin attending practices at Beat the Streets. Soriano’s son Samir, age five, also liked the event. Samir had plenty of moves to show off, executing a few against his father and almost taking him down! There was not much hesitancy on behalf of the wrestlers to step--or jump--into the circle. The audience witnessed strong pushouts in the two-minute rounds and equally powerful takedowns. No matter how fierce the competition became, the atmosphere was always festive. The wrestlers smiled a lot; the competitors looked happy to have stepped into the circle even when they were occasionally being tossed by their opponents. There finally came a time when Bigley himself hit the mat as a part of the Bigger Guys division representing the team “3 Men & a Southern Gentleman.” He won a close first match with a 1-0 score against Tyler Sheridan from The Fron Headlocks, a team representing Columbia University’s wrestling program. Bigley then waged another evenly-matched battle against eventual Bigger Guys champion Mario Mercado of Team Renzo Gracie, with a respectable 1-2 outcome. Bigley was not the only member of Beat the Streets to rise to the challenge. Mike Novogratz, the Chairman of the Board, also stepped up. Novogratz could be seen getting pumped up before his first match in the Older Guys division. It was clear that Novogratz was fully energized, wasting no time in making a takedown in the first fifteen seconds of his first match. While he won the match with a tough 8-1 score, both Novogratz and his opponent looked to be having a great time. Novogratz’s second match was close and fierce, ending with a last-second takedown win and a score of 8-4, making him the champion of the Older Guys. Of course, one did not have to be an older guy to want to give back. The Close to College Weight class was made up of younger men who had proven themselves as highly accomplished in the world of wrestling, foreshadowing the upcoming NCAAs and reliving some Ivy League rivalries. Only a few years ago at the NCAAs Walter Peppelman (Harvard) had taken 8th place in the NCAAs, Daniel Kolodzik (Princeton) made the round of twelve, and Jake O’Hara made the round of sixteen (Columbia). These longtime rivals and friends experienced some exciting rematches and were happy to give back to the sport. The Light Guys bracket was another model of friendly sportsmanship. Rob Hitschler of team #EiterEra beat Tony Comunale of the Old Tigers in a close 2-1 match. Both men were smiling up until the very end and could even be heard planning to grab beers after the match. The afternoon was full of skillful takedowns and evenly matched competitions. “This is blowing me away,” said Kirk Bedell, another member of Beat the Streets’ board. Expectations were being surpassed by the teams, the wrestlers, and of course, the donors. Excitement carried through to the very last rounds as the finalists of the Biggest Guys bracket squared off. There were a few laughs on the mat as the older guys tried to execute some sophisticated moves on one another--with mixed results. The Fron Headlocks won the Top Team award, having made an impressive showing on the mat and bringing in a huge $5,645 for youth wrestling programs. The men of the Headlocks were happy to strike poses and show off their trophy, a statuette of Lady Liberty’s torch.Voting for King of The Mat was close, but ultimately went to Mario Mercado of the Bigger Guys bracket. Mercado took home the trophy, a statue of the Empire State Building being climbed by none other than a miniature King Kong. 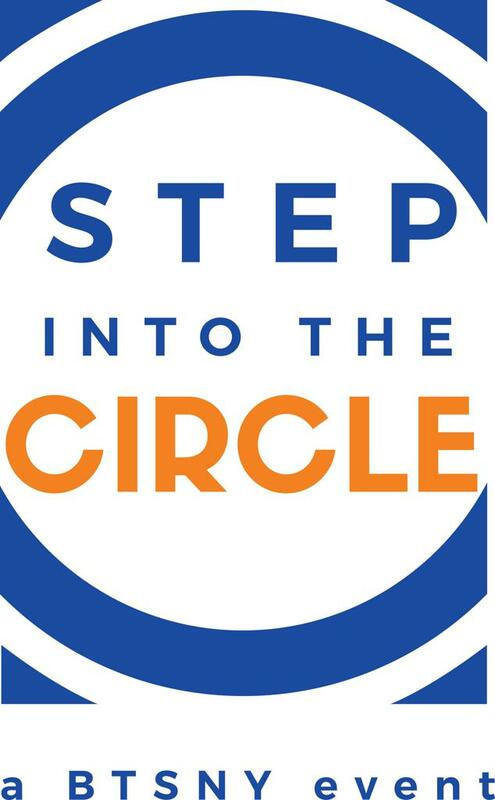 Beat the Streets has a lot of people to thank for helping to make the first Step into the Circle a huge success: Fusion Physical Therapy for donating ATC services, Liberty Harbor Residences for sponsoring the bar, and all of the volunteers for donating time and resources to the event. Thanks again to the wrestlers and fundraisers who put on such a stellar display of talent and teamwork, and thanks most of all to our sponsors and supporters, who are doing everything to bring the life-changing sport of wrestling to kids all across New York City. The Crowdrise for this event can be found here.